We were delighted to be welcomed to Bramble Brae School on Wednesday 16 January to run one of our Primary Future events. We organised a ‘What’s my Line’ quiz as well as speed networking events, allowing the pupils to speak to as many volunteers as possible. Amanda Murray, head teacher at Bramble Brae reflects on the event. Belonging, Believing, Achieving, the motto of Bramble Brae School, encapsulates the vision, values and aims that we aspire to. A key driver of this vision is the work on employer engagement, developing the young workforce and the world of work. I would like to take this opportunity to thank Primary Futures and Education and Employers for recognising the work of the school. I would also like to thank the volunteers who not only supported us at the event but over the past two years as we have developed our approach. As Head Teacher I am immensely proud of what we have achieved and look forward to seeing where this whole school journey takes us. 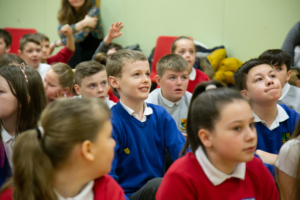 The charity, Education and Employers, calls on primary schools to sign up to its Primary Futures programme and invite in volunteers to come in to school to talk to children about their jobs and also for people to volunteer just a few hours a year to go.